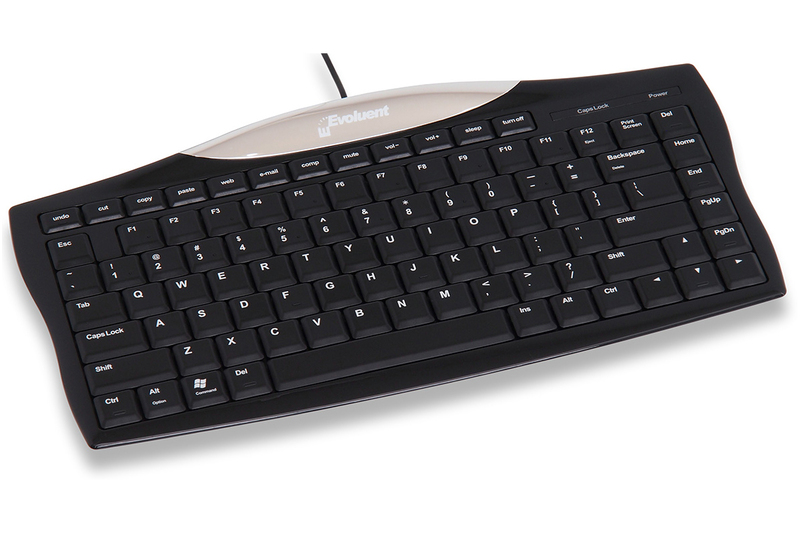 Standard Keys: Despite its compact dimensions, all the keys (including the function and modifier keys) on the Evoluent Essentials Full Featured Compact Keyboard are standard sized, with standard key pitch (i.e. the distance between keys). 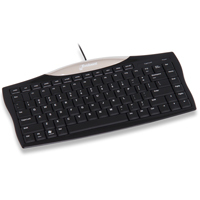 Raised Dots and Ridges: Tactile dots and ridges alert experienced touch typists to the position of important landmark keys. One-Touch Hotkeys: Hotkeys provide one touch access to frequently needed functions (Cut, Copy, Paste, Undo, Web, E-mail, Computer, Mute, Volume Down, Volume Up, Sleep, and Turn Off). The ultra-slim housing of this mobile-friendly keyboard warrants a little extra care when handling. Try to type with as light a touch as possible to minimize the risk of damage to the keyswitches, and to prevent the housing from flexing. When removing the keyboard from a bag or briefcase, avoid damage to the keys by grasping the sturdy silver trim on the top edge (with the Evoluent logo).